Whether you are facing Alzheimer's disease yourself, or are caring for a loved one who is, the Alzheimer's Store has the products and resources to make life easier and safer. Memory phones and day/date clocks encourage on-going independence, while the incontinence supply product line helps to keep those in later Alzheimer disease stages clean and sanitary. Cognitive stimulation supplies to aid in memory retention, and caregiver-focused spiritual resources are also offered at the Alzheimer's Store. They feature a selection of alarms and locks designed to protect Alzheimer's disease patients from episodes of wandering. A diagnosis of Alzheimer's disease is always difficult. 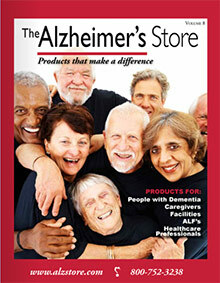 Let the Alzheimer's Store make daily coping a little bit easier.